It's time to reflect on some of the projects I did in 2013 and there were quite a few. Painting the kitchen island cabinets was one of the most satisfying projects that I did last January. Bead board wallpaper transformed the side of the tub in the master bath. I took on the task of painting and reupholstering the dining room chairs. The guest room went from nautical to farmhouse style. Chest painted and added to the sunroom. Armoire painted from weathered to red. Master bedroom walls were painted a little lighter. Painted the end table in the sitting room in Miss Mustard Seed's Grainsack. Painted grain sack striped table. The The Sitting Room was painted Wheeling Neutral by Benjamin Moore paint. Grain sack striped bar stools for my daughter. That was a lot of projects for 2013 and now it's on to 2014. Please join me tonight for an early Wow Us Wednesdays, due to the holidays, and it is all about sharing your 2013 projects. Love the look back, Kim. Your cabinets looks great as does everything else. Fun to see all you have accomplished this past year Kim! this was fun. you did so many great projects- stand up and take a bow~! Be a sweetie and looking forward to blogging with you next year! 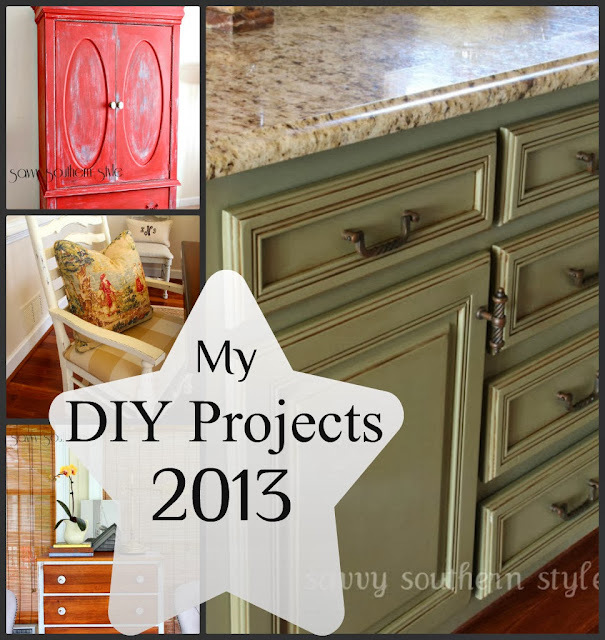 Wow, you certainly had lots of great projects this year! !…My fav are those kitchen cabinets!! It's amazing to see all that you accomplish in one year! I wanted to say thanks for encouraging me this year. I have thanked you and linked back to you on my blog. http://www.domesticcharm.com/thank-you-for-everything-in-2013/ You are an inspiration to me and I just wanted you to know that! Oh, Brenna, aren't you sweet. It thrills me that you can find inspiration here. I would have replied to your email directly, but you have no reply comment set. Happy New Year! such inspiration. thank you. Happy New Year to you and mr. savvy. Such great projects Kim! You've inspired me to paint a table with grain sack stripes! Looking forward to seeing more of your projects in 2014. You were one busy lady Kim. They are all beautiful . . . I am always so blown away by all the projects you complete! Congrats on all of your accomplishments! Can't wait to see what you do in 2014! So many wonderful Projects Kim, truly glad to discover your blog! CHEERS to 2014!!!! Great projects Kim! Love them all....but I must admit I am in love with your butcher block! Wow what a beautiful find and you made it shine! Best wishes my friend in the coming year! Kim you accomplished so very much. All awesome I might add. Happy New Year to you! I don't know how you do all you do, Kim. I feel like a slug:( Everything you touch turns out beautifully! Happy 2014!!! You've had so many great projects, Kim. LOVE those grain sack stripe pieces! Thanks for sharing all the projects for 2013. It was fun seeing the recaps. Happy New Year! Hi Kim! How is the AS Laquer holding up on the cabinets? I am getting ready to use it on mine. Thanks much! Your projects are inspiring Kim and I look forward to seeing what creativity you have in store for us in 2014. Happy blessed and creative New Year!